Kembalikan kepada wanita Malaysia nikmat rasa selamat dan aman di Malaysia. This open letter is written in English not because we degenerate Bahasa Malaysia, but rather because we would want more readers to read it either local or foreigner. I’ve read and heard lots of negative remarks been pass either towards my wife or myself with regards to the GSTT (Untrained Substitute Teacher) issue. Most shocking is that most of the negative remarks are made by women of this country. To be frank, we both are not happy and sadden with the negative reaction given by many people. But then again someone dear to me said that people will say anything as long as god willing they can talk. We are not a simpleton. Let’s clear the air out. We are not selfish and neither are we ignorant. We are most certainly not arrogant nor are we trying to make a name for our self. Some people have the nerve saying that my wife has not completed her education or rather never went to school. Mind those who think that way. The remarks made are personal and clearly those who made such remarks making statements without thinking of the implication of such statement. It is an insult to my wife and my in-laws to say such thing, as it’s like saying that my in-laws never educate their daughter or the very least never sent their daughter to school. If my wife had never completed her education, would she be selected to be appointed as GSTT in the first place? If her knowledge and skill are not savvy enough, would she passed the interview and been called up to fill the GSTT position? Please refrain yourself from making statements that are personal in nature, as you do not know us and we do not know you. A more constructive comment would be more acceptable than such personal attacks comments. Let me briefly explain the actual events that happen that led to the retraction of offer to my wife. Before the D-day as I called it, on the 2nd January 2009, my wife went for an interview at the PPD Hulu Langat. The interview was conducted in several sessions for few days. In the interview, among the question was asked includes general knowledge; personal and education background; and scenario based questions (incidents that could happen in the school and the actions ought to be taken). None of the question asked includes health status or more specific pregnancy status. Even in the forms of application that was filled up before the interview date and prior to the interview did not request for the information. A few days later, on the 11th January 2009, my wife received a SMS from one of the PPD Hulu Langat personnel congratulated my wife for being selected and requesting my wife to take the placement memo from the office on the 12th January 2009. My wife was jubilant receiving the news. On the 12th January 2009; the D-Day, after taking the placement memo, there was a short briefing by an officer. My wife was supposed to start work as GSTT and report for duty at Kajang High School right after the briefing. At the end of the briefing, the officer requested that anyone that is pregnant, to step forward. My wife and 2 other women step forward. Immediately the placement memo along with the offer letter was taken from them. 1 of the other 2 was already pregnant for 8 month (my wife later find out after the black incident). My wife and the other 2 was devastated, just because they are pregnant, they was denied the opportunities of being employed as the other candidates. My wife felt that she was to be blame for the pregnancy (which I also play an important role in the first place). Imagine how humiliated and disgrace my wife and the other candidate felt. To be told to come forward as like they have committed a horrendous sin or criminal act and to be punished without just cause. We did not immediately go straight to the media. We try to plea our case to various channels and agencies. But to no avail. It was a dead end. We were the unheard voices and our concerns were taken lightly. My wife was told to calls from one department to another. All of them denying responsibility. My emails did not receive any definitive or positive answer either. We almost lose hope. Almost. We thanked to our parents from both sides that had been very understanding and supportive to us. They are the one gave us the morale spirit throughout the ordeal. 1. To those who so blindly called my wife as being selfish and ignorant, what would you do? Accept it as fate and move on. Right, most of you will say that. Even we, accept our fate as it is. But the wrong must be corrected. Otherwise it will keep on happening until the end of time. 2. Don’t you think it’s too much that these women whom are pregnant have to accept such disgrace and humiliation? To be called out like a convict criminal and being punish for their pregnancy. We are married couple and it’s our god given right to bear children and by common law there is no objection to having children under marriage. 3. Could a “man” whom had received the placement memo and offer letter, at the end of the briefing all of it is retracted due to being pregnant? NO, as only a woman could bear a child in her womb. It is god given gift meant only for women as no man could bear the pregnancy process. 5. How can the government encourage the private sector to stop discrimination against women when it is happening in their own back door? 8. The MOE Chief Secretary had made a statement that the criteria were made for the importance of the students. MOE worries that if a GSTT teacher were to take maternity leave (unpaid by the way according to JPA General Order 17 Chapter C (Leave)), it would affect the learning and teaching process of the students. What about the permanent teacher whom are pregnant and have to take maternity leave? Will their students learning and teaching process not affected by their teacher’s absent? Why such double standards practice being implemented? 9. In General Order 17 Chapter C (Leave), a GSTT are not eligible for maternity leave. Why such discriminating order is was ever approve? 10. Under the Labor Act 1995, there is a section for Maternity Protection. However this seems to be pointless as there is a clause for void should the employer chooses not to follow it. It’s like saying a person can choose to run the red light even though the laws says it’s wrong but it also says you can choose not to follow it. Isn’t it confusing and illogical? The key word is MATERNITY PROTECTION and not ESCAPE FROM MATERNITY PROTECTION. I could be writing pages of question for you to ponder and think about. But I believe that by now you get my point. My advices do some readings and you will find out that there is much to be deliberate. Look at this case in more general views. It is not only about the appointment of GSTT, it is about the prejudice towards women everywhere in our beloved country. I know some of you might have experience this first hand and simply keep mum about it. If none of you are willing to bring the matter forth, it is going to happen to someone else and it’s going to get worse. This sort of discrimination is happening everywhere in the government agencies and private sector. We have tried various channels in voicing out our concern and our objection in this debacle. But to no avail. Some of my friends whom are politically active were not very supportive with our cause either. Instead I was accused of deliberately blaming everything on the BN government; I was being ungrateful to the BN government, etc. Let me make it clear again that the issue at hand is not a political in nature. It crosses all political ideology. One other organization (NUTP) that seems interested to assist us, but when contacted; my wife was told that they only assist members. The only sincere assistant we had is from Wanita PKR Chief YB Hajjah Zuraida Kamaruddin and her colleagues. We thanked them from the bottoms of our heart. We were even offered a legal counsel aid. I would also like to comments about “beloved” leaders whom spoke so very highly of themselves. They spoke about justice and transparency above all else. They spoke about changes in the country. Well in this case I’ve not seen any. Where are the UMNO leaders? Where is Dato’ Mokhtar Samad Division Head of UMNO Bandar Tun Razak, whom I might add, refuse to even listen to our plea for help. Instead he is more concern about his own political gain and personal interest? He was busy having a “meeting” with an UMNO General Assembly candidate along with others representative (perwakilan) from Bandar Tun Razak. It is been said that the meeting was held at his house on 31 January 2009. I have an SMS from him that neither denies nor agrees the purpose of the meeting is for their own personal gain or some say “cari makan”. If it’s true, shame on you and please resign from your post and from UMNO. UMNO do not deserve a person such as you. I would suggest that you quit from UMNO and create your own party that would suit your own needs and agenda. By the way, I’m supposed to be a member of UMNO Taman Bukit Anggerik, but due to some misunderstanding in the past, my name is not listed till now. My situation can be confirmed by my Head of Branch Taman Bukit Anggerik, Bandar Tun Razak. Where is the so called lioness of UMNO, Dato Seri Rafidah, Wanita UMNO Chief and her deputy Dato Seri Sharizat Abdul Jalil? Are they still quarrelling about whom should be Wanita UMNO wing Chief? 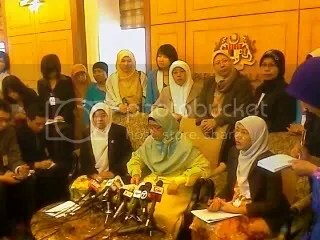 We’ve been called up by Wanita PKR Chief, Puan Hajjah Zuraida Kamaruddin last January 2009. To be honest we agree to the meeting with heavy hearted. We are worried that this issue will be politicizes by the party. As we believe this issue should not ever been politicizes. However during the meeting Puan Hajjah Zuraida made a statement that the issue is not a political issue. It crosses the political ideology. The statement was made prior to our confession that we are UMNO members. My wife is a member of Puteri UMNO Sungai Rawang Branch, Sepang Division. I questioned these UMNO leaders as they (or at the very least Dato Seri Rafidah) are part of the Members of Parliament of the Federal Government. They are the one that should be interested in the issue. Instead, an opposition Member of Parliament is the one whom offer assistance and show much interest in the issue. Where is the leader whom so proudly brandishes a Keris in last UMNO General Assembly, Dato Seri Hishammuddin Tun Hussien, of the Malaysia Ministry Of Education (MOE)? Your email address is nowhere to be found. How can you be a Minister of Education when you do not even have an email for communication purposes? In this age of information technology, an email is an essential part of your communication tools either personal or business purposes. Even my sweet beloved mother has one and she is a full time house wife. Furthermore the personnel of your ministry also seem not very knowledgeable of their own ministry / department Service Circulation. They have quoted some statements from certain Service Circulation which is not true at all. Please look into this matter, maybe the personnel from the ministry should be educated first before we started to educate others. Where is the ever so vigilant Senator Murugiah Thopasamy, Deputy Minister in the Prime Minister Office, whom is more concern about the a suspected criminal in a luxury car theft syndicate and the wellbeing of foreign workers from Bangladesh? Should you be more concern about our complaints? I believe we have more merits than a suspected criminal (no offence to any party, I’m trying to make a point) and foreign workers. We are citizen of Malaysia. We demand retribution. Where are the leaders of Wanita MCA whom submitted a memorandum on 23 February 2009 to Dewan Rakyat Speaker, with regards to sexist remarks amongst the MPs? The Minister of (KPWKM) is a member of MCA. Shouldn’t the Wanita MCA also submit a memorandum with regards to this issue? It is clearly a discrimination against women. This issue is not a political issue in nature. All leaders should address this issue accordingly as it is a public interest issue. It crosses political ideology, race and religion status. Consider this open letter as an outburst towards all parties whom had failed to address this issue even after we have sent countless emails to your agencies. Consider this open letter also as an answer towards all those whom so lightly pass judgments towards my wife and me without knowing the exact facts of the incident. There are more than the stories that you have heard and read. If you only see what is under the rug, you will see a whole lot more. Take some time before making such personal remarks to anyone. Do unto others as you would like others do unto you. 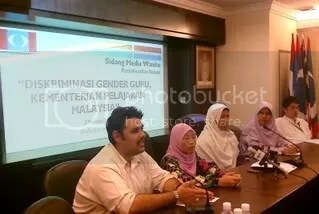 Ternyata berlakunya berbagai diskriminasi dan ketidakadilan berdasarkan gender terhadap wanita di Malaysia. Wanita Malaysia sering berdepan dengan pelbagai halangan dan diskriminasi dalam usaha merealisasi sepenuhnya potensi mereka untuk menyumbang kepada pertumbuhan ekonomi, politik dan budaya negara. Contoh kes terkini Noorfadilla Ahmad Saikin yang dinafikan peluang untuk menjadi guru sandaran semata-mata kerana beliau hamil adalah secebis daripada bongkah air batu yang lebih besar. Kesetaraan gender bukan bermakna menyamakan lelaki dengan wanita atau bersikap neutral gender tetapi ia bermaksud menanam kesedaran tentang perbezaan antara wanita dan lelaki dan mengiktiraf kedua-duanya mempunyai keperluan dan peranan yang berbeza, pengalaman hidup yang berbeza dan kekuatan dan kelemahan yang berbeza, terutama apabila merebut peluang pekerjaan. Dengan itu, Wanita Parti KeADILan Rakyat, yakin bahawa Kesetaraan Gender cuma akan tercapai jika kerajaan Malaysia mengambil langkah-langkah yang positif dan tegas untuk membasmi semua bentuk ketidaksetaraan gender. Meminda Artikel 8 Perlembagaan Persekutuan tanpa mengadakan peruntukan undang-undang yang spesifik untuk menghapuskan diskriminasi atas dasar gender tidak akan menghapuskan ketidaksetaraan ini. Sikap acuh tak acuh kerajaan Malaysia terhadap diskriminasi gender menimbulkan andaian bahawa kerajaan mendokong fahaman seksisme dan menganggap taraf dan nilai wanita lebih rendah daripada lelaki. Oleh yang demikian, sudah sampai masanya semua saranan yang releven di bawah CEDAW (Convention on the Elimination of Discrimination against Women) dikuatkuasakan oleh kerajaan Malaysia dengan serta merta. Wanita Parti Keadilan Rakyat menggesa Kerajaan Malaysia menubuhkan satu tribunal yang berfungsi mengadili semua aduan tentang diskriminasi gender terhadap mana-mana individu, badan dan organisasi. Wanita Parti Keadilan Rakyat, menyokong Deklarasi Beijing (1995) yang menyatakan “Kesetaraan antara lelaki dan wanita adalah berhubungkait dengan hak asasi manusia dan adalah salah satu syarat untuk mencapai keadilan sosial.” Malaysia tidak akan dapat menikmati pembangunan yang kekal dan berterusan jika hampir separuh daripada rakyatnya yang produktif dinafikan peluang yang sama rata untuk mencapai impian mereka. Overwhelming evidence shows that discrimination and injustice against Malaysian women on grounds of gender persist. Malaysian women continue to suffer disadvantage and gender discrimination and being deprived of equal conditions for realizing their full potentials to contribute to national, economic, political and cultural development. Our present case involving Noorfadilla Ahmad Saikin and the Ministry of Education is only the tip of the iceberg (attached is Press Release : Diskriminasi Gender Guru, Kementerian Pelajaran Malaysia, 28 Januari 2009). Gender Equality is not about treating men and women the same or being gender neutral but to take cognizance of the differences between women and men and that women and men have different needs and roles, different life experiences and different disadvantages especially in the labour market participation. Wanita Parti Keadilan Rakyat believes that the Government of Malaysia must take positive and affirmative action to eradicate gender inequality. Mere act of amending Article 8 of the Federal Constitution without specific legislative provisions to outlaw discrimination on grounds of gender is insufficient to eliminate gender inequality. The indifferent attitude of the Malaysian Government towards gender discrimination implies their endorsement on sexism and the acceptance of the belief that women is inferior to or less valuable than men in our society. The relevant recommendations under CEDAW (Convention on Elimination of Discrimination against Women) must be implemented by the Government of Malaysia without further delay and any reservation. Wanita Parti Keadilan Rakyat, urges the Government of Malaysia to enact new law and provision to end immediately all forms of discrimination against women AND to make all discriminatory policies, express or implied, and discrimination on grounds of gender an offence under the law. Wanita Parti Keadilan Rakyat, also urge the Government of Malaysia to set up a tribunal to deal with complaints of gender discrimination against any organization, body or enterprise. Wanita Parti KeADILan Rakyat, upholds the Beijing Declaration and Platform for Action (1995) that “Equality between men and women is a matter of human rights and a condition for social justice.” Malaysia will not be able to enjoy long and lasting sustainable people-centered development when almost half of the productive segment of the country is deprived of the equal opportunity to realize their dreams. Wawancara TV Antara bersama Ketua Wanita, Zuraida Kamaruddin. Sidang media Ketua Wanita KeADILan telah berlangsung petang semalam(3 Februari). Ia adalah berkenaan diskriminasi gender Kementerian Pelajaran telah berlaku ke atas Noorfadilla Ahmad Saikin. Noorfadilla telah ditarikbalik tawaran kerja sebagai Guru Sandaran Tidak Terlatih (GSTT) oleh Pejabat Pelajaran Daerah Hulu langat awal Januari 2009 lalu. Turut hadir di sidang media tersebut ialah Timbalan Ketua Wanita KeADILan, Rodziah Ismail yang juga EXCO kerajaan negeri Selangor, peguam yang mewakili Noorfadilla, Edmund Bon dan Ketua Penerangan Wanita KeADILan, Elizabeth Wong. Wanita KeADILan akan memastikan bahawa Noorfadilla dilayan secara adil menurut Perlembagaan dan ketetapan-ketetapan konvensyen antarabangsa yang ditandatangani oleh kerajaan Malaysia. Diskriminasi gender seumpama yang berlaku ke atas Noorfadilla sepatutnya tidak berlaku sama sekali di negara ini. 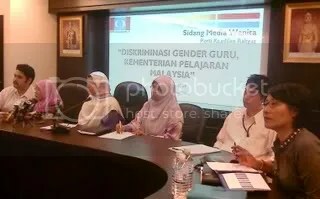 Ia mencerminkan sekali lagi betapa sebahagian dari kakitangan dan jentera kerajaan Malaysia sama sekali tidak peka atau tidak langsung memiliki kecelikan gender yang kehendaki dalam pengurusan dan pentadbiran kerajaan minda kelas pertama. Seksisme (sexism) adalah usaha atau tindakan, sama ada secara sedar atau tidak, yang merendah-rendahkan martabat dan status wanita. Dalam negara yang mendokong demokrasi, pemikiran berunsurkan seksisme menafikan peluang dan hak wanita dalam pelbagai perkara dan bidang, khususnya dalam proses membuat keputusan yang terbaik untuk negara dan masa depan rakyat Malaysia di mana 50% daripada penduduknya adalah terdiri daripada wanita. “Itu dikira sebagai suatu defisit dalam demokrasi yang meminggirkan pengalaman, pengetahuan dan kepakaran wanita dalam bidang-bidang yang diceburi dan diterajui mereka,” kata Ketua Wanita KeADILan, Zuraida Kamaruddin. Sebelum ini, Wanita KeADLan telah beberapa kali mengutarakan keburukan-keburukan seksisme dan pemikiran yang berkaitan dengannya. Seksisme mesti ditangani dengan tegas dengan denda-denda yang setimpal, khususnya jika ia berlaku di Parlimen, yang menuntut pertuturan, bicara dan tindakan yang mulia. Mereka yang mengeluarkan kenyataan atau ungkapan-ungkapan yang seksis terbit daripada Ahli-Ahi Parlimen, khususnya daripada BN dalam persidangan-persidangan di Dewan Rakyat. Insiden-insiden seperti yang berlaku pada 9 Mei, 2007, di mana insinuasi berbau seksis daripada dua orang Ahli Parlimen, Radin Bung Mokhtar (BN-Kinabatangan) dan bekas Ahli Parlimen, Mohd Said Yusuf (BN-Jasin) terhadap wakil rakyat Batu Gajah, Fong Po Kuan, serta kes membabitkan Ahli Parlimen (BN-Pasir Salak), Tajuddin Abdul Rahman baru-baru ini. Tegas Zuraida Kamaruddin, insiden-insiden yang mencemar maruah wanita di Parlimen mencerminkan defisit dalam penghayatan sensitiviti gender di kalangan wakil-wakil rakyat, malah memperlihatkan keadaan buta gender. Situasi sedemikian mengunjurkan suatu natijah yang membimbangkan bilamana para wakil rakyat dituntut untuk menggubal dasar-dasar yang mengesani 50% daripada penduduk Malaysia yang terdiri dari wanita; kebimbangan bahawa perspektif dan keperluan wanita dialpakan, secara sedar atau tidak, dalam perbincangan menggubal dasar-dasar negara kerana wujudnya pemikiran seksis sedemikian. “Berbagai pihak, khususnya daripada kalangan Wanita KeADILan sendiri telah lama mengutarakan agar tindakan tegas diambil terhadap wakil-wakil rakyat yang cuai dalam memelihara sensitiviti gender dalam persidangan-persidangan di dalam atau pun di luar Parlimen,” kata Zuraida. Antara yang telah dicadangkan ialah menggantung status Ahli Parlimen selama enam bulan, didenda dengan melaksanakan khidmat sosial kepada organisasi wanita selama enam bulan, menderma elaun Parlimen yang diperoleh kepada organisasi wanita, menyatakan maaf kepada mangsa seksisme. Sekiranya enggan, khidmat sosial dalam organisasi wanita itu dilanjutkan sehingga 12 bulan. Seksisme yang berpunca daripada sifat dan pemikiran yang ingin mendominasi yang lemah akan menghasilkan dasar dan peraturan-peraturan yang seksis juga. Ia mendiskriminasi wanita dalam semua aspek dan wanita akan dipinggirkan dalam kebanyakan bidang, khususnya dalam proses membuat keputusan. Pendiskriminasian tersebut akan memberi kesan negatif terhadap kesejahteraan wanita dan secara tidak langsung juga akan memberi kesan negatif terhadap kesejahteraan rakyat Malaysia yang kebanyakannya dipelihara dan dididik oleh wanita. Zuraida Kamaruddin menyeru agar sekalian wanita dan lelaki, khususnya Ahli-Ahli Parlimen agar bergandingan dalam memastikan seksisme hapus sepenuhnya di Parlimen Malaysia. Perbezaan parti mesti diketepikan demi menjamin kedudukan mulia wanita yang telah diiktiraf oleh konvensyen-konvensyen dan badan-badan dunia. “Kaukus Parlimen Wanita perlu segera aktif semula dalam mengarusperdanakan gender, sekali gus melenyapkan sebarang bentuk seksisme, khususnya di Parlimen,” kata Zuraida. Undang-undang bagi mengawal daripada berlakunya seksisme juga perlu dititik beratkan. Idealisme politik Pakatan Rakyat sewajarnya menjadikan Negeri-negeri Pakatan Rakyat contoh terbaik dalam menangani isu seksisme ini.